Re: Where from, and where to? Thanks for the offer. Transsiberia sounds great! Is Feb 2010 a good time to do the presentation? We have a full line-up of monthly presentations all the way till then. Wow... 7 months in Cambodia, that sounds exciting too! would love to hear yr adventure 1 day. forum on sabbatical and money matters would be great! so wee cheng. would the timing be tight for 3 talk? i setting aside 11th dec but my roster will only be out on 30 nov. so once confirmed, i can do a small side presentation on central north india, covering allahabad with the 4yearly kumbh mela festival, as well as varanasi and delhi/agra. can do 20mins on it concisely, or longer if u like. but problem is i probably can only do in dec, as jan i have hi key ICT, feb-apr i having intense course/exams and some overseas courses. only in may then may be free. or i have to ask mat about it? but i hope this pxn i can get to know more ppl. and hopefully can gel up a small group for mexico 2010 nov photographic trip mid-budget trip hopefully set at 3k. below 4k, somewhat like my bosnia and croatia trip recently, which is abt 2-2.5k. and best if someone speaks spanish. and apologise for infringing copyrights. The author of this image is Wikipidia user Tomascastelazo. 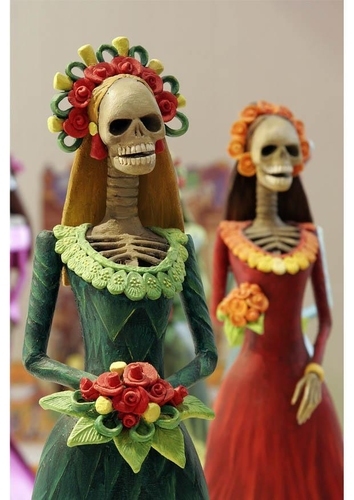 is the skeleton of a high society woman and one of the most popular figures of the Day of the Dead celebrations in Mexico. Height : about 15 inches - 38 cm. Hi Zoosch, remind me again...can't remember who you are. I am better in remembering names than nicknames. Thanks for offering to present, but timing is too tight for 3 talks. We should stick with 2. Kumbh Mela/Allahabad/Varanasi sounds exciting - maybe we can do a 10min Brief Moment session for that. We have topics/speakers lined up till April. Fine if you are only available in May. I can put your name down for May if that is so.